We grilled last week. I took this picture using a Leme photo app on my iTouch. 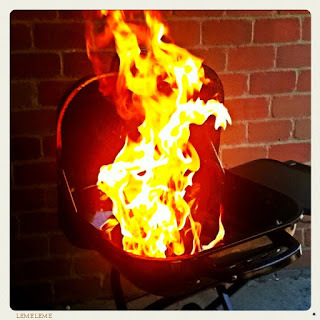 I took this picture after my husband added lighter fluid to the coals. Men just love to show off! My husband also prefers the charcoal grill instead of gas. We tried the gas grill and the food never tasted right so we switched back to the charcoal. I am a new follower of your blog thru GFC and would love a follow back when you get a chance. Thanks so much and have a great week! That's amazing: Like a rabbit rising from the flames!